The Samsung Galaxy A7 has a 120-degree ultra-wide-lens triple camera and 6-inch AMOLED Immersive Display. So you can fit more into each frame and get lost in what's on your screen. Widen your world with the 120-degree ultra-wide triple camera – complete with easy depth of field adjustments for on-point focus, and low aperture to let more light in your photos. Take better selfies than ever thanks to a 24 MP front camera and the Smart Beauty facial recognition mode. Lose yourself in photos, movies and games with the Galaxy A7's 6-inch Immersive Display. The FHD+ Super AMOLED screen offers sharper contrast and vivid colours for an enhanced viewing experience. Topping it all off is a 2.5D glass body, which is as durable as it is easy on the eyes. three-dimensional effect. 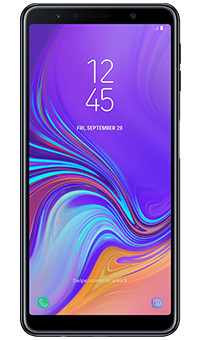 The Samsung Galaxy A7 features Dolby Atmos, engineered to create and play back multichannel soundtracks to provide an immersive home cinema sound experience. The Galaxy A7 offers expandable microSD storage up to an additional 512GB, so you'll never run out of space for your photos, video and music. * And with face recognition and an intelligent side fingerprint sensor, your files and data will always be easily accessible and safe. *MicroSD card sold separately. External memory may be used to store media (photos, video and music files) but not applications.